I often operate in hyperbole. [hahy-pur-buh-lee]: (noun) an obvious or intentional exaggeration. Or, as I tell my students: An exaggeration to make a point. For example, "I had to wait FOREVER for my food at Olive Garden to arrive." I did not literally wait FOREVER, otherwise I would still be sitting at Olive Garden waiting for my dinner. I was simply making a point--I waited an exorbitantly long time. I operate in this near-constant state of exaggeration because #1: it makes for much better story-telling and #2: it is necessary to convey the world as I experience it to someone else. This is not to be mistaken for being overly dramatic (a.k.a. drama queen-y). I am not a drama queen. Ask Jonathan. I have no tolerance for drama from those that surround me (tough luck, considering I'm in a house of all girls and I teach high schoolers--gah!). I don't even like myself when I get all drama-y. Operating hyperbolically means simply that I must stretch the boundaries of reality in order to make others understand my reality. I'm not adding drama, I'm adding truth. Let me give you an example. I was driving home from school yesterday with my 3 children in the back of the mini-van. Child 1: Can I have my bookbag? I want to look at my valentines. Me: I can't reach your bookbag right now. I'm driving. We'll look at them at home. Child 2: Yeah, I want my bookbag, too! Me: At home, sweet pea. Gotta drive. Child 1: I smell poop! Me: Child 3, did you have an accident? Child 3: No! I did not! Child 2: Yes, she did. Child 3: No! I just farted. Child 1: I wish I had my valentines. Then I could smell my candy and not your fart. Me: I can't reach them right now. Sorry. Child 2: I am so hungry. Can I eat some of my valentine candy? Me: You can eat 1 piece of candy. Child 2: Yay! I need my bookbag, I need my candy. Me: Not right now, I'm driving (I say through clenched teeth). *I'd like to insert here that in hindsight it might have been a smart pre-emptive move to put their bookbags within their reach before we left school. However, that opens a whole other can of worms, so I was simply trying to control the environment. I realize now that sometimes control is overrated. Child 3: I have my bookbag! Me: How'd you reach that? Child 3: With my foot. Me: Nice work! Very dexterous of you! Child 1: That's not fair, I want my bookbag! Me: It's not an issue of fair, she could just reach hers. Child 1: Yeah, but I'm not close enough to reach mine. I wish I could switch seats with Stinky Pants. Then I'd have my candy. Child 2: Me too! It's not fair! Child 3: I'm not a Stinky Pants! Me: (sigh) Stop calling her Stinky Pants. Child 3: Haha! Look at all of my candy! I'm going to eat it all! Me: No. Just one piece. Child 3: But that's not fair! I'm so hungry! Child 1: She's bragging. That's so mean! Me: Okay, everyone needs to stop complaining. You can each get a piece of candy when we get home. Child 2: (mumbling) Stinky Pants didn't have to wait. Child 3: Can I eat another piece of candy! Child 1: Stop kicking me! Child 2: (with impish grin) I didn't kick you. Child 3: Okay, now I have to go the bathroom. This scene would be considered a good day. No one is crying (yet). No one has actually had an accident in the car. No one has started screaming. I lack the literary prowess to fully convey what a bad day would look like. Just multiply this scene by a factor of 12 and we might start to get somewhere. There have been days when I actually grab the roots of my hair in my fists simply because I feel like my head is going to explode. The mental and emotional toll I'm feeling is physically painful. To the world, this seems hyperbolic of me--an exaggeration. Yet, to me, this is reality. Not literal reality because I know, rationally, that my head will not explode. But the pain is there. It's real. So real that I actually cannot form words, let alone sentences, to answer my children's questions, to quell their arguments, to assuage their concerns. I can only, literally, hold my head. 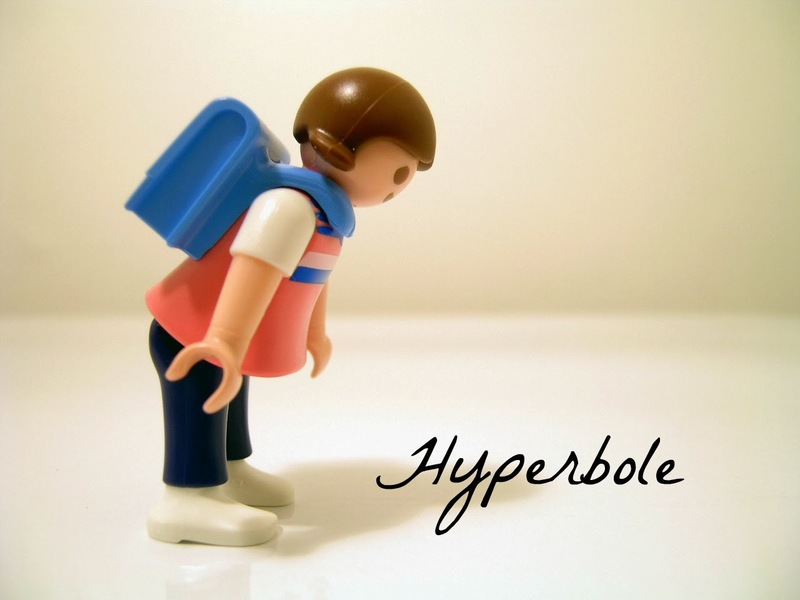 So, I don't know about you, but hyperbole is a near and dear friend to me. When Jonathan asks, "How was the drive home from school" and I say "I didn't rip out my hair" he knows it's been a good day. He knows because I operate in hyperbole. He knows because my hairline is still intact. And he knows he'll probably be on duty for cooking dinner while I go someplace quiet so my brain can de-pressurize. Hyperbolically speaking, of course. PS: I would add to those of you who think I'm painting a bleak picture of my children and our daily interactions, please don't think me heartless. I love those three wee munchkins dearly and unconditionally. If I didn't my head wouldn't be so full nor the ache of it all quite so real. So feel free to judge me if you must. I'll be over here not listening to you and eating my children's valentine candy. 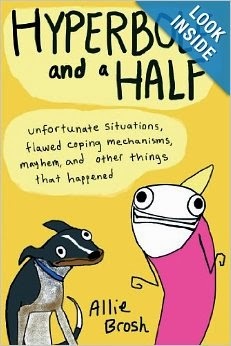 PPS: Speaking of hyperbole, I just read the new book put out by Allie Brosh entitled Hyperbole and Half: Unfortunate Situations, Flawed Coping Mechanisms, Mayhem, and Other Things That Happened. I identify with so much of what she writes about (though she's an actual artist who draws delightful illustrations of her experiences, whereas my drawings . . . not so delightful). She is hilarious and honest, and I HIGHLY recommend her book. Enjoy! Oh goodness, Anna, how familiar. Only now it's my six widdle grandkids having those conversations with each other. And you know what? I sit there and laugh my head off (hyperbolically speaking). All of that is hysterically funny since I'm not responsible for teaching them to be better than wild animals. 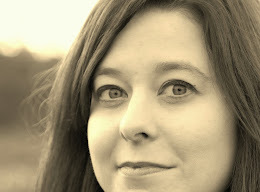 My sons think aliens abducted the mean old hag that raised them and left a nice lady. They feel cheated. Grandkids are such a relief. Thank you for the encouragement, Danni. I await the day when I can laugh--laugh at this season of insanity, laugh at grandkids, laugh just because. I feel most days that I too am turning into a mean old hag trying to teach my children to behave better than wild animals. Maybe I'll laugh at that one day too. Glad to know I'm not alone in this. Have a great day, Danni! Yes. Yes. And yes. Poor Stinky Pants. (Although the line, "I wish I had my candy. Then I could smell my candy and not your fart." is pure genius. And yes, Allie Brosch. I have the book and have been saving it like your kids' Valentine Candy. I want to savor it and not gorge on it, like your kids' Valentine candy. I wrote a really similar post about that post-school time when my kids get extremely needy and impatient. Sometimes I just go to the bathroom or step onto the deck (even in the snow) and cry a little. Just a little. I call it "me time." Ah, yes, the bathroom sanctuary. Been there, my friend. And cried the tears. Thanks, Amy. And enjoy Allie Brosh. Definitely something to savor! This was SUCH a delightful read, Anna! I was laughing aloud throughout the entire conversation as it played out crystal clear....not just because of your words, but due to very personal, and very frequent experience. LOVED this. So glad I could bring some laughter to your day, Jeane! I actually was laughing while writing it because I was struck again and again by its absurdity. Though, rest assured, I was not laughing during that car ride. This is hysterical. I've missed out on reading recently. I needed a good laugh! Thank you!